In 2010, 8% of all children in Canada and 22% of children living in female lone-parent families were living in poverty. Prince Edward Island and New Brunswick had the lowest rates of child poverty overall. In PEI, 2% of all children and youth lived in poverty, which was the case for 3% of New Brunswick’s children and youth. 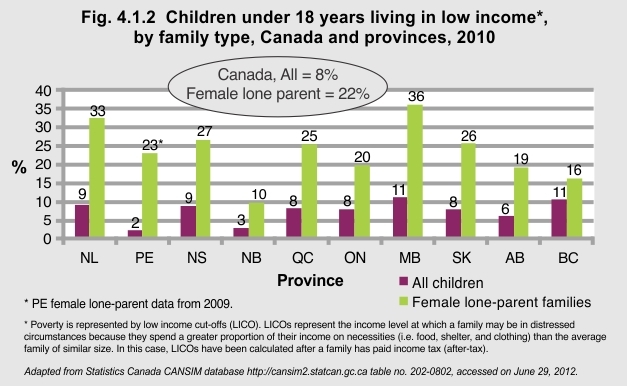 In New Brunswick, 10% of children and youth living with female lone parents lived in poverty. Manitoba and British Columbia had the highest rates of child poverty in Canada. In both Manitoba and British Columbia, 11% of all children and youth lived in poverty. In Manitoba, 36% of children and youth living with female lone parents lived in poverty. 1Welfare income for a lone parent with a child aged two includes basic social assistance, other provincial benefits, federal child benefits, provincial child benefits, provincial child benefits, GST credit. 2“Campaign 2000, 2011 Report Card on Child and Family Poverty in Canada.” Accessed on June 29, 2012 at http://www.campaign2000.ca/reportCards/national/2011EnglishRreportCard.pdf.